Thank you for your interest in EdGCM! 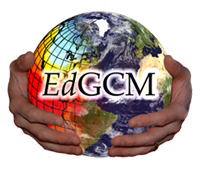 With your support, the EdGCM Project can continue to make available the world’s only user-friendly Global Climate Model. Institutions that require an invoice (for purchase orders or payment by check) should contact us for additional information about submitting payment. For payment by major credit card, PayPal or wire transfer, we ask that you fill out a brief registration form. We will then send you an email with a link to our secure shopping site, hosted by FastSpring. Volume discounts are applied at the end of the payment process. Students may also purchase fully functional individual copies of EdGCM for $29 (textbook purchase method), with no institutional site license requirement. Proof of academic status is required however. Please contact us for the current discount code. It is possible to purchase a combination of both Mac and Windows licenses. Please contact us prior to purchase for additional information.